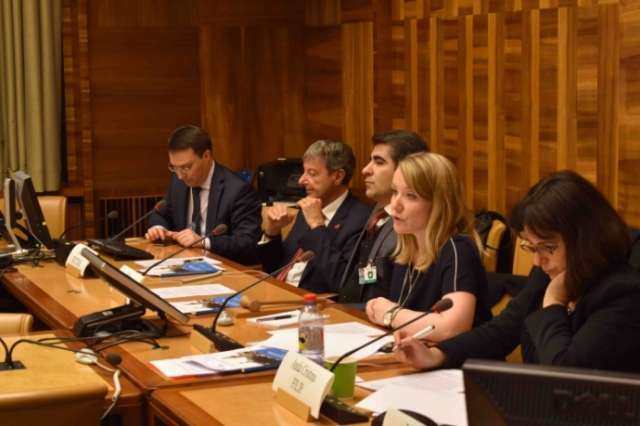 The Azerbaijani concept of intercultural, inter-religious dialogue has been upheld as a model for other countries during a conference held in the Palais de Nations at the UN Office in Geneva as part of a series of events organised under the framework of the Geneva Peace Week. The event on 7 November was organised by the French office of The European Azerbaijan Society Foundation (TEAS), the State Committee for Work with Religious Organisations of the Republic of Azerbaijan, and the Azerbaijani Permanent Mission to the UN Office and other International Organisations in Geneva. The Conference entitled Preventing Conflicts Through Intercultural Dialogue – The Example of Azerbaijan attracted more than 70 delegates, including numerous Ambassadors, together with representatives of various diplomatic missions, NGOs, research institutions and international organisations. Taking into account the increasingly tense and polarised nature of the contemporary world, which is riven by conflicts according to religious and ethnic lines, the example of Azerbaijan – located at the intersection between Asia and Europe – was cited as a model. Since ancient times, Azerbaijan has been inherently tolerant, and multiculturalism is now a state policy. Reflecting this, the Azerbaijani government has organised the Baku International Humanitarian Forums and World Forums on Intercultural Dialogue, which are supported by the UN Alliance of Civilisations (UNAOC), UNESCO and Council of Europe, amongst other organisations. Baku also played host to the Seventh Global Forum of the UNAOC and its eponymously named Baku Process has advocated international dialogue for nearly a decade. In May this year, it also hosted the fourth biennial Forum on the theme of Advancing Intercultural Dialogue: New Avenues for Human Security, Peace and Sustainable Development. Baku has also been selected as the host for such international and multicultural events as the Baku2015 European Games (organised under the auspices of the European Olympic Committees) and the Islamic Solidarity Games. Mr Mammadli explained: “Our religious tolerance dates back to the fifth century A.D., when Jews were given land in Guba and, after the Zoroastrian period, Christianity was the state religion of Caucasian Albania. Azerbaijan has always encouraged every faith, and today we see situations where Muslim Azerbaijanis and Christian Georgians pray together, and a new Catholic cathedral has been constructed with state support. “The background to the Azerbaijani interpretation of Islam is Sufism, which emphasises the need for love, brotherhood and respect for the spirit of common humanity. Despite the ongoing Armenian–Azerbaijani Nagorno-Karabakh conflict, the Armenian Church in Baku still stands and has been restored by the Azerbaijani state. Pope John Paul II visited Baku in 2002, and a new synagogue has been constructed for the Mountain Jews. Lionel Zetter, Director, TEAS, continued: “The Azerbaijani model of secularism, and its peaceful experience of inter-religious dialogue, must be viewed as a unique and successful model – especially in today’s context of globalisation and global threats to security. Mr Zetter then recalled his recent visit to Jojug Marjanli – an Azerbaijani region, under the Armenian occupation in the past, liberated during the ‘Four-Day War’ of 2016. He recognised the work undertaken to reconstruct the village, but also the cost in human life, and that this indicates the volatility of the conflict if peace does not prevail. Dr Daniel Pommier Vincelli, Researcher and Adjunct Professor, Sapienza University of Rome, observed: “During the period of the Azerbaijan Democratic Republic (ADR) (1918–20), representatives of the so-called ‘Caucasian Azerbaijan’ tirelessly advocated for the international community to recognise Azerbaijani independence. At that time, Nagorno-Karabakh was not Armenian, Azerbaijani or Russian, as the modern concept of a state did not exist. The event concluded with a lively question-and-answer session covering such topics as religious education, highlighting the study by both Shias and Sunnis in the Baku Islamic Academy, the work of the Jewish School in Baku and the illegality of the Armenian state occupying Nagorno-Karabakh following ethnic cleansing.